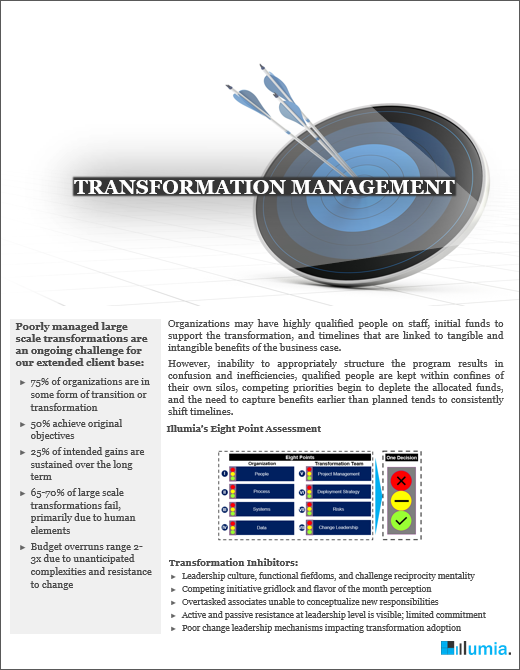 Organizations may have highly qualified people on staff, funds to support the transformation, and timelines that are linked to tangible and intangible benefits of the business case. However, inability to appropriately structure the program results in confusion and inefficiencies, qualified people are kept within confines of their own silos, competing priorities begin to deplete the allocated funds, and the need to capture benefits earlier than planned tends to consistently shift timelines. Culture as a stand-alone is an abstraction -- difficult to pinpoint, let alone measure, and is frequently viewed as a lower priority, yet missed financial targets, inability to get things done, low engagement scores, poor morale, and high turnover continue to carry tremendous costs for the organization. At Illumia, we know we are on to something very powerful. 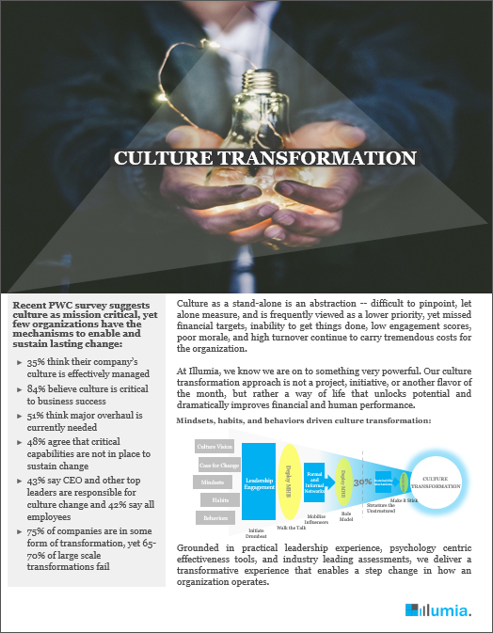 Our culture transformation approach is not a project, initiative, or another flavor of the month, but rather a way of life that unlocks potential and dramatically improves financial and human performance. The notion of teamwork is often misconstrued as code to get along while ignoring the perils of low trust, poor commitment, lack of accountability, and misalignment across the team. These topics frequently remain unaddressed and continue to perpetuate subpar team and organizational performance. 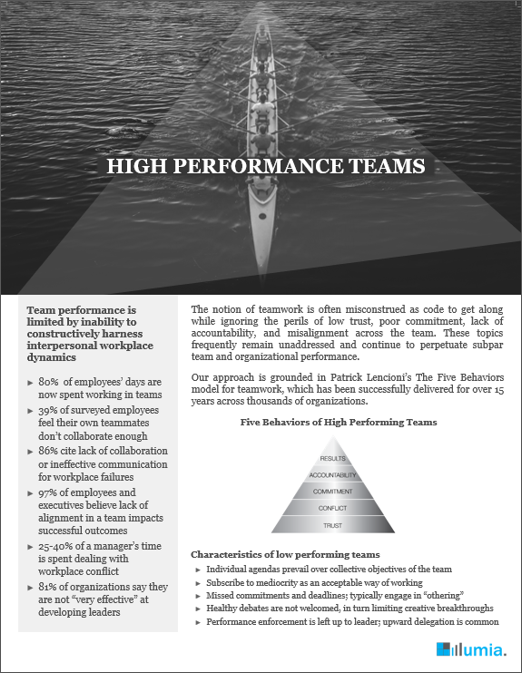 Our approach is grounded in Patrick Lencioni’s The Five Behaviors model for teamwork, which has been successfully delivered for over 15 years across thousands of organizations. Poor hiring decisions can be costly – both in terms of quantifiable financial impact of recruitment, training, selection and just as importantly a bad hire’s morale and productivity impacts on the remainder of the organization. We help our clients avoid these costs by delivering powerful insights that make the very human decisions about hiring simpler and smarter. Powered by the latest in candidate assessment technology, Illumia leverages PXT Select™, an innovative, data driven, and multi dimensional assessment to help organizations select, onboard, coach, and develop their team members. 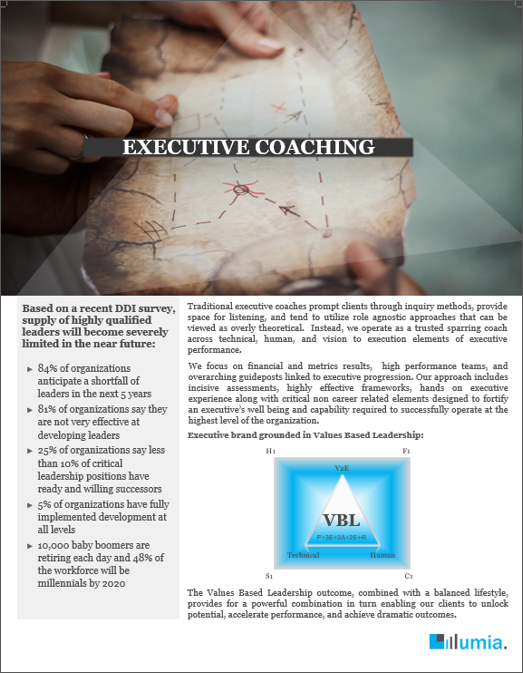 Leadership development is one of the largest spend areas in corporate training, yet organizations fail to develop leaders that are prepared for the future. 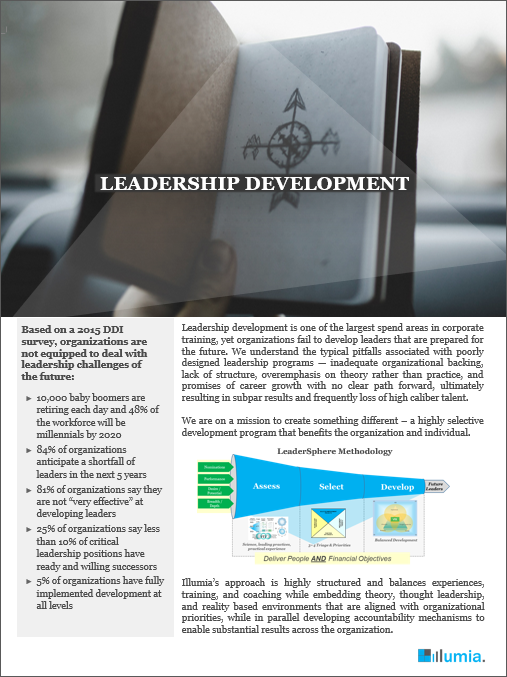 We understand the typical pitfalls associated with poorly designed leadership programs — inadequate organizational backing, lack of structure, overemphasis on theory rather than practice, and promises of career growth with no clear path forward, ultimately resulting in subpar results and frequently loss of high caliber talent. We are on a mission to create something different – a highly selective development program that benefits the organization and individual. Traditional executive coaches prompt clients through inquiry methods, provide space for listening, and tend to utilize role agnostic approaches that can be viewed as overly theoretical. Instead, we operate as a trusted sparring coach across technical, human, and vision to execution elements of executive performance while enhancing the inquiry method. The Values Based Leadership outcome, combined with a balanced lifestyle, provides for a powerful combination in turn enabling our clients to unlock potential, accelerate performance, and achieve dramatic outcomes.